In Part II, I will cover some general information about the M951 makeup, namely the M951’s technical specifications, individual parts and kit designations of the M951, and the different “generations” of the light. Stock Photo for stock specs. *I have not found this weight to be accurate. Every M951 or M952 I have owned has never exceeded 12 ounces with batteries installed. My current M951 Gen 2 Fat Body with heavier than stock mods weighs in at 10.5 ounces with batteries. These designations were acquired through a passive read through a long gone Surefire M951 manual, and painstaking forum and eBay auction lurking. The terms have been verified through multiple sources using similar terminology. M951KIT02 Contents and Parts Designations. Simple, right? No. No it’s not. The parts designations are the same throughout the M951’s lifespan, but that’s where the consistency ends. In reality, each part underwent some upgrade or refinement during the lifespan of the light, and most of these refinements did not come with a designation change. Why this is, I do not know. I assume it has something to do with US Military CAGE Codes or NSNs. All I know is that each designation is representative of the part itself, but not any particular production variant of said part. In short, the M951 is a very fluid light with a lot of unmarked generational changes. Surefire M951XM07 kit and contents. There were a few designations for completed lights and accessory groups, or “kits”, which remained consistent throughout the lifespan of the M951 as well. I assume that there are a lot more out there than I have found, but these are the ones I have seen and can confirm as genuine Surefire kits, complete with Surefire box and sticker. An old box for an old Surefire M951SU06 kit. The stickers and boxes pretty much stayed the same throughout production runs. All M951s are basically the same in functional terms, with some universal attributes like mounts and battery capacity, as well as near complete parts interchangeability. As mentioned before, though, there are many different design variations for parts with the same designation. Although there are no official generation designations for the light as a whole, there are some consistent build patterns which constitute colloquial generational designations. In the clearest cut terms, there are three recognizable and distinct generations of the M951, wherein most or all of the parts that make up the light underwent a noticeable change. The Generation 1 M951 is extremely rare, and were made probably as early as the very late 1990’s until the very early 2000’s. The Generation 1 light has an incredibly unrefined yet rugged appearance. It bears a passing resemblance to the later lights, and is still somewhat parts interchangeable from what I have found. I’ve only seen a few for sale, and they were beat to all hell and missing parts. I can’t cover much about this light other than what I can see in the few pictures I have sourced from the internet. Most of what I will be talking about in this whole series will have to do with the Generation 2 and Generation 3 M951s. Surefire M951XM07 “Generation 2”, the “Fat Body”. The Generation 2 M951 is known colloquially as the “Fat Body” due to its thick (thicc) profile MH90 Body. They are often referred to as Generation 1 lights, but that is only because of the scarcity of information and surviving examples of the actual Generation 1 light. The Generation 2 light is vastly more common that the Generation 1, but still a bit rare today, at least in good to new condition. I’ve seen more than a few of them for sale on eBay, and have owned two myself, including a brand new one which I still have. Most of the ones you find for sale though will have scratches, dents, electropencil markings, and blue paint marker a la .mil issue. Generation 2 lights were made from the early 2000’s until around the mid 2000’s. Surefire M951XM07 “Generation 3”, late production. This is a photo of a light I once owned. Although the Generation 3 is the most common, there are no stock pictures of the final Generation 3 on the whole of the internet. The Generation 3 is by far the most common variant (although I guess stock pictures are not). It was the final version made until the light was discontinued some time in the early 2010’s. When someone envisions the Surefire M951 in their mind, the Generation 3 is probably the variant they see. The changes made to the light were mostly for weight and bulk reduction. The proliferation of LED drop in upgrades to replace the P60 Lamp, including Surefire’s own upgrades, also meant that excess metal was not necessary for heat sinking. Thus, these lights look a lot more skinny and less tank-like, but they are still very strong overall. Surefire M951XM07 Generation 2.5. 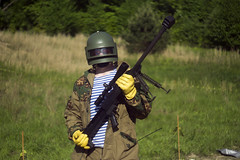 This is the last Surefire stock image of the M951. This light has mostly Generation 2 parts, but has a Generation 3 M2 Bezel, MH90 Body, and M49 Thumb Screw Mount. More on these differences in Part III. There are also what I would call Generation 2.5 lights that have certain parts that were from both Generation 2 and Generation 3, but not enough of an overhaul to warrant a separate generation. There are also certain parts that underwent very small changes between the Generation 2 and Generation 3 final specifications, all of which will be covered in the next section. That’s it for the broad strokes regarding the M951 parts and generations. The next article will be the specific breakdown of individual M951 parts as they pertain to the M951’s respective generations. If you are savvy consumer or a gear junkie, you have probably already bought an M951 off of eBay after reading the first segment. Part III will shed some light on exactly which light you have, Generation 1, 2, 3, a transitional model, or just a frankenlight. If you want to start reading the autistically detailed list on all of the individual parts variations of the M951, check out Part III. Next story The Queen of Thief!